First of all we need to create a new VM inside VirtualBox (select the name of the VM, the OS and finally the correct version. For my purpose Linux Debian 64 bit). Select the RAM available for the VM (At least 2GB is highly recommended if the machine hosting the VM has enough capacity), available disk space and disk image type. For the disk image I usually select VMDK as it is compatible with VirtualBox, VMWare and few other products as well. Once the setup process of the new VM is complete, start the machine and select the Debian iso file to boot from, and to proceed with the installation of the OS. 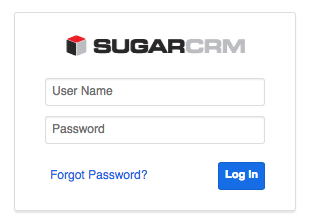 Select the hostname to be “sugar” and the domain name as “local” (important for all the subsequent steps as the whole tutorial assumes the machine can be reached by the hostname “sugar.local”), select the root password and the additional details required by the users setup process (I created the users/passwords root/root and sugar/sugar for simplicity). Continue with the disk partitioning process and the base OS installation. On the “software selection” section, unselect everything and then selecting only “SSH server” to have a minimal system without any GUI. Access the machine via SSH as root, to proceed with the setup. Now setup the network interfaces within the OS (adding a static and a dynamic one) by editing /etc/network/interfaces. On VirtualBox, click on “Preferences”, then “Network” and then “Host-only Networks” and finally add a network or click on “vboxnet0”. On the IPv4 section type 10.10.10.1 and make sure that on the “DHCP Server” section, DHCP is disabled. Shutdown the VirtualBox machine (sending the “ACPI Shutdown” signal) so that the additional interface can be added to the virtual hardware. Navigate to the “Settings” and “Network” option of the VM. Attach “Adapter 1” to the “Host-only Adapter”, to “vboxnet0”. On “Advanced”, make sure to re-initialise the MAC Address to avoid problems. 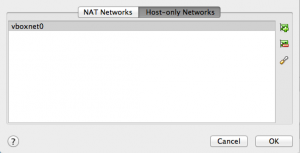 Enable “Adapter 2” and attach it to the “NAT”. Make sure to re-initialise the MAC Address as well. Start the VM and log in as root, making sure internet still works (eg: ping a website). To be able to make this setup work correctly, add on the host file the entry “10.10.10.10 sugar.local” (/etc/hosts if using Linux or OSX). Now there will be two interfaces on the linux box, the first one on the Host Only network (10.10.10. * network without dhcp, using the static ip 10.10.10.10 for our internal communication) and the second one with access to the local internet connection via NAT. To SSH into the machine from the local environment, first complete a ping test to sugar.local, and if it works fine then SSH into the VM as root (ssh root@sugar.local) so that the following commands/scripts can be easily copy/pasted. Access the machine via SSH as root. Proceed with some of the PHP configuration. To find out the full list of supported timezones, visit this PHP manual page. To be able to run commands as root, even if not logged in as root, the software Sudo can be installed.. This is not an essential step but as I am used to it on the Ubuntu world, below are the steps on how to install and setup the software. Logout from the VM and login as “sugar” (ssh sugar@sugar.local). From now on, when it is required a privileged user to complete an action, run “sudo <command>”. We can then disable the user root from accessing the system via SSH (only complete if the previous step works correctly). Sugar 7.5.2.0 requires ElasticSearch 1.4.4 as its own search engine, as described on the supported platform documentation. To know more about elasticsearch, setup, best practices, scaling and security settings read Sugar’s documentation. Additional useful configuration settings can be found on this GitHub gist url. 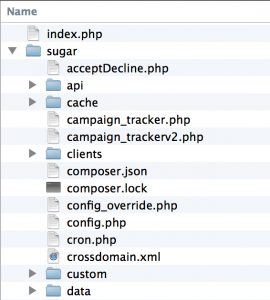 The sugar system will have the url “http://sugar.local”. If the web server is accessed in any other way, a message should be shown on how to properly access the system. To be able to achieve this goal, simplify the development and allow the use of the preferred local PHP editor, a service such as Samba can be installed. Then it will be possible to mount on the local system, the VM file system as a remote drive. Mounting the drive locally will also make sure that the permissions are always correct, as they are enforced by the Samba configuration. Personally I use vi/vim to code, but please note that Samba could slow down the experience created by the local editor as Samba adds quite a bit of overhead. During configuration’s testing, I realised that changing the VirtualBox virtual network card to “Intel PRO/1000 T Server” helped with Samba’s performance. Now it should be possible to mount the /var/www folder of the server in the local environment as a Samba shared drive. For OSX use the path “smb://sugar.local”. In case there is an anti virus enabled, make sure the scanning of the mounted Samba shared folder is disabled, as it might noticeably slow down the performance of Sugar, especially during the regeneration of the cache files. To allow to remotely connect to MySQL from the local machine, change bind-address from 127.0.0.1 to 10.10.10.10 on /etc/mysql/my.cnf. Finally test mysql access from the local machine with “mysql -u sugar -h sugar.local -p” with the new password. Now that the infrastructure is setup, it is pretty trivial to follow the installation wizard of Sugar. Proceed with the software setup, leaving ElasticSearch settings as prompted by the system. To tune the database it is suggested the use of a Perl tool called MySQLTuner that helps with tweaking settings based on some system’s history. The only caveat is that the MySQL server should run for a while to be able to build up usage history. 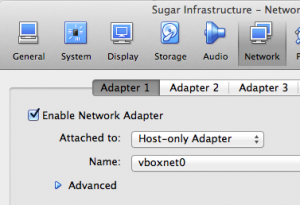 This tutorial helps with the creation of a local VM for Sugar development. It helps quickly prototype solutions, snapshot, copy and destroy VM when/if required. It is supposed to be used just as a guideline and it is not intended to be a full guide on how to setup a system for production purposes. Some of the settings used on this article can be quite helpful, as they will help with the setup of a live environment, but there are many other best practices that should be observed when setting up a production system. There is no SSL configured during the installation, therefore do not choose an official password for the sugar instance as it won’t be secure. Never setup an environment with sensitive data without SSL! For the same reason, and for the fact that all passwords suggested on the post are trivial, do not install any customer data on this instance. The blog post has been written in May 2015, using Debian 7.8 with the most recent available versions of the LAMP stack at the time. Sugar Enterprise 7.5.2.0 and 7.6RC4 run successfully on this setup during the tests. If you have suggestions or comments on how to improve usability, performance, security, setup procedures etc. or anything else you can think of, please do not hesitate to add a comment below, thank you! Recently I built a set of docker stacks that can help. Note that the Sugar application’s code is obviously not included. Credit goes to Cédric Mourizard for the initial work with Docker. 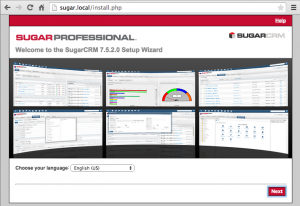 Do you have a guide for Debian 8 and SugarCRM 7.9 for a production environment? If not, what changes or additional steps would you take on top of this guide? This guide was really helpful. Thank you! Frankly, the settings for a production environment are a little trickier. They do depend on many variables and case by case needs (eg: they can change based on your DR strategy and HA strategy, on your usage patterns, if there are integrations involved, how many records are present on the database, if it is a cloud or bare metal installation and the list goes on). I did create a docker based dev/test environment for Sugar 7.9. You can find the link the bottom of the article. Feel free to have a look at the settings I used there. That could be a good starting point for you, especially on the PHP side. You will have to work more on the Elastic and MySQL side for performance tuning for sure.